The depreciation of a new car is an inevitable, if painful, fact of life. Some car buyers, however, are likely to feel that pain more acutely than others during the global economic downturn. Take for example the Toyota Aygo driver. According to the UKs Parkers Car Price Guide, owners of one of these fuel-sipping minicars would have seen the value of their asset depreciate by just £1,515 (about 1,630, or 18 percent of its new cost) in 2008 -- the lowest cash depreciation on any car, says the guide. 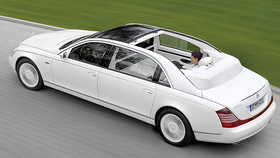 At the other end of the pain spectrum are those exclusive few who own the ultraluxury Maybach limousine. Parkers tells us that the owners of these cars lost an eye-watering £128,000 (137,000, or 39 percent of its new cost) in depreciation during the last 12 months. Perhaps it is now a case of: If you have to ask how much it depreciates, you cant afford it.